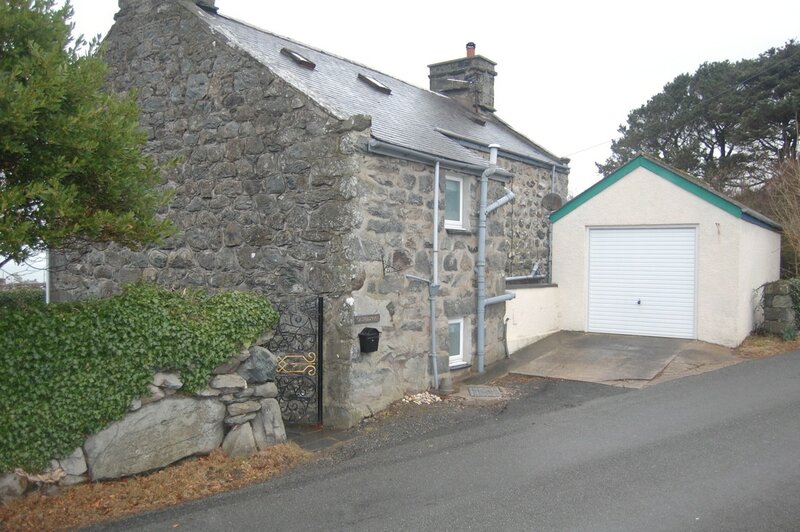 We are very easy to find, and live just off the main A496 coast road just south of Harlech. If you put LL46 2RU in a sat nav, we are NOT on the main road itself, but on the village road parallel to the main road. From the north. From Harlech travel south on the A496 in the direction of Llanbedr (and Barmouth). When the Harlech 30mph limit changes to 40, continue for another half mile. After the sharp left bend overlooking the sea, ignore the crossroads but after the next left bend turn left, signposted 'Llanfair'. Then follow step 3, below. From the south, Drive through Llanbedr. After the long straight, the road goes up hill. Just after the 40 mph signs pass the Play Barn (and Slate Caverns) on the right and take the road on the right (signposted 'Llanfair'). Then follow step 3. below. Drive though the old part of Llanfair village. Pass the church on the right and the small car park on the left (a good place to park up). Immediately after the car park there is a converted chapel on the left (village hall opposite). 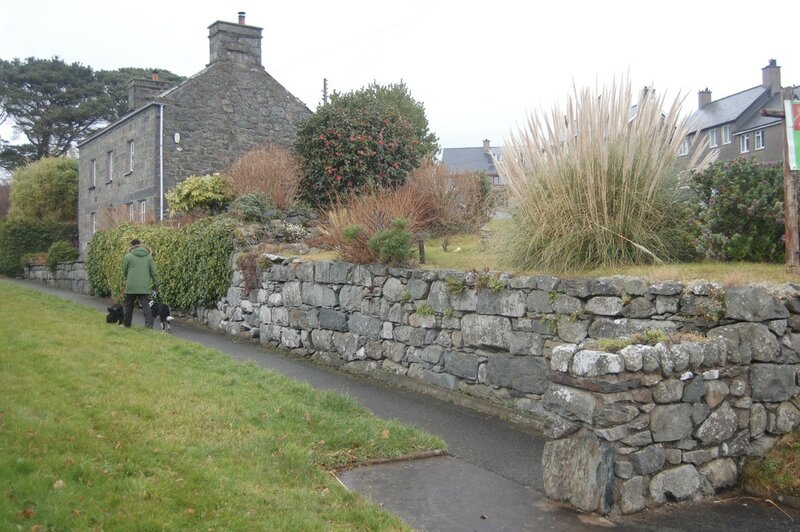 Castellfryn is the next stone house on the left, where the road narrows and with a footpath in front - see the pictures. 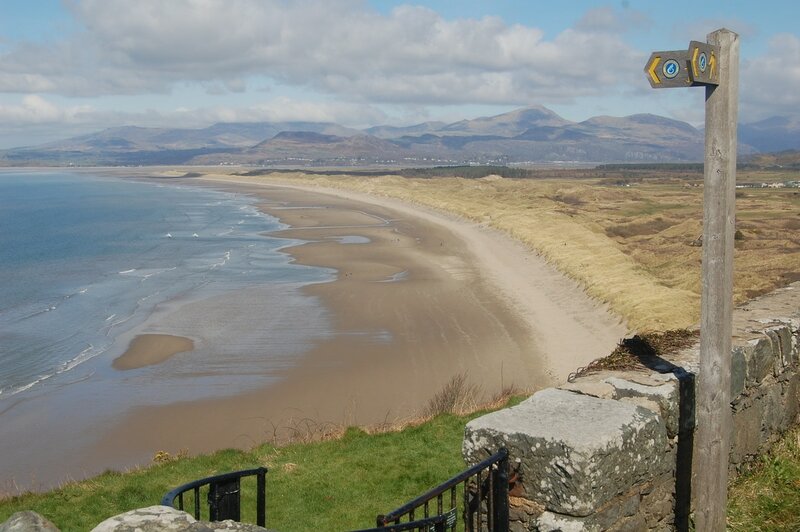 We - and your dog if boarding - are just 5 minutes walk to the path down to Harlech Beach. Stuart is the mature owner of Max, a cocker spaniel, and Buster who is a collie cross. He lives in Llanfair near Harlech and is used to working outdoors, having previously been a land surveyor. 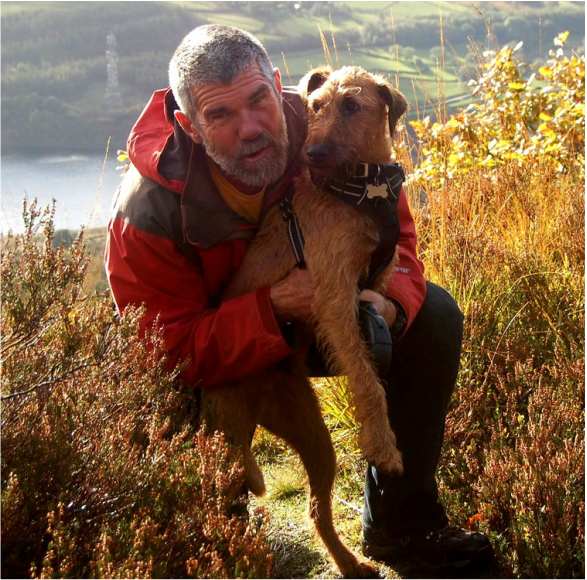 Stuart has owned dogs for most of his life and dog walking combines this with his passion for walking. 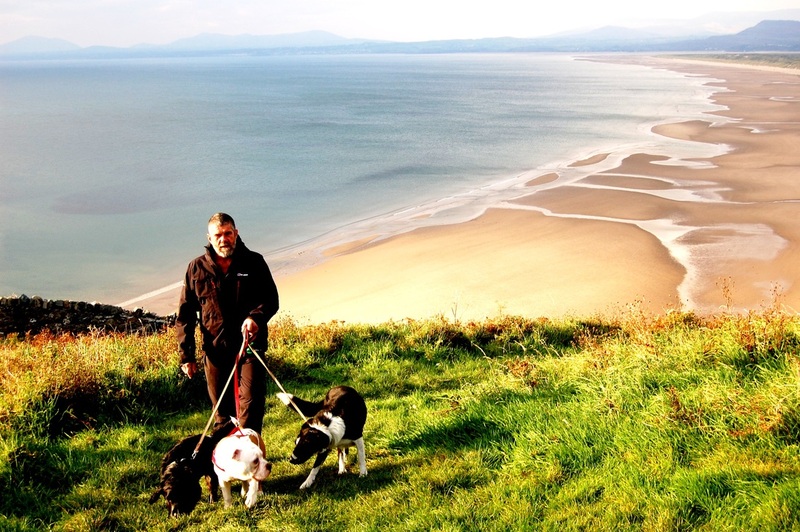 The Gwynedd coast from Porthmadog to Talybont provides opportunites for exceptional walks that Stuart would love to share with your own dog. 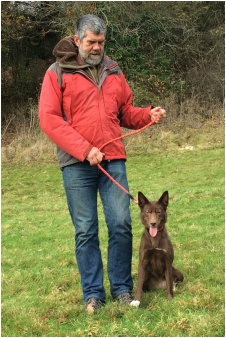 Stuart has undertaken a Dog First Aid course so is prepared for the very rare possibility that a canine emergency occurs. He is DBS checked (Disclosure and Barring Service - formerly CRB) for your peace of mind when entering your home. The testimonials also provide evidence of Stuart's love of dogs, together with his trustworthy nature. 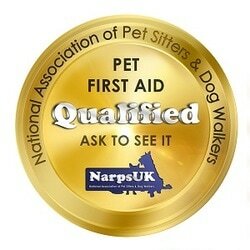 Stuart is fully insured with Pet Business Insurance for undertaking services associated with dog walking. This includes public liability insurance, on- and off-lead walking, pet minding, dog boarding and pet collection (pet taxi). ​Stuart is a member of the National Association of Pet Sitters & Dog Walkers. So you can be sure that he is a true professional. Stuart has often owned rescue dogs. His most recent are Aris, Buster and Max. Aris, a cross-hound who recently sadly passed away, came from Manchester Dogs Home after he was found on the streets. Stuart looked after him for most of his life, during which time he changed from a timid and frightened hound into a faithful, well-behaved and loving companion. He used to come to work on some of my land surveying jobs in the countryside where he could just loaf about. His best dog friend was Mason, who he stayed with during my overseas holidays. 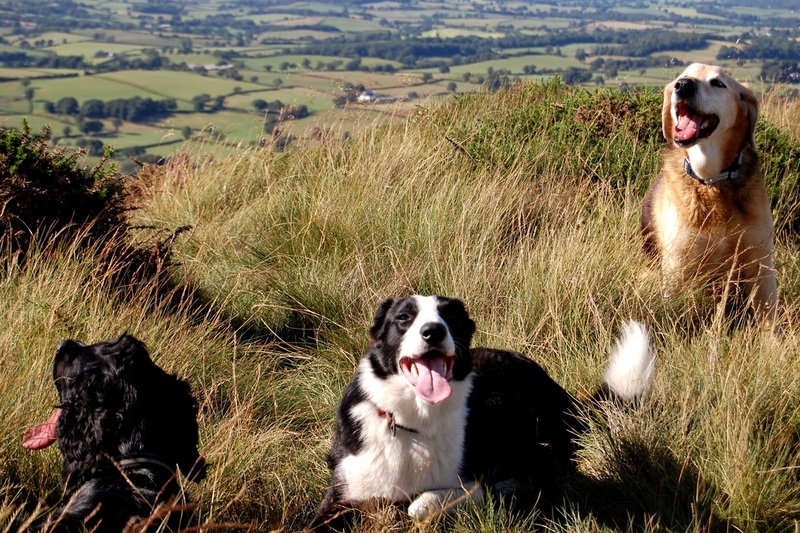 Buster, a collie-cross, came from North Clwyd Animal Rescue near Holywell on the North Wales coast. He was there for three years, having been rehomed but then sadly returned. Buster is very loving and his behaviour has improved enormously, though he is still afraid of loud sounds such as lorries or the vacuum cleaner. Buster likes to be outside and barks at the prospect of a walk. He still has occasional issues but his development shows what a caring and loving relationship can achieve. Max was rescued not from a dogs home but from the friend of a friend. He was locked up for most of the day and was desperate to have the freedom, excitement and human contact that we could offer. Max taught Buster how to play and these two mates are now inseparable. Max is very affable and, uinlike Buster, is afraid of very little - he even swam out to a friend's paddle board to be part of the fun! He joins other dogs on group walks if there is room as he is very sociable. Front of Castellfryn, by the footpath. Rear of Castellfryn, beside the road through Llanfair village.